You are at:Home»7th Fleet»Back to the Philippines? It’s getting more jittery in the Pacific. North Korea’s failed launch of a missile April 12 gives them more drive to conduct their next nuclear underground test, if nothing but to show the world that its new leader, Kim Jong Un, is just as tough and threatening as his paternal predecessors, defense analysts say. All that missile rattling, along with China’s growing military might, has heightened insecurities in an already-tense Asia-Pacific. With the U.S. strategy now taking a keener eye on the Pacific, and the brass talking more about ramping up training and deployments around the region, some of the Navy’s old haunts might be open to seeing more sailors, and their warships, in their seaports. Like the Philippines. It’s been nearly a generation since sailors and Marines lived, trained and played in the Southeast Asia island-nation. The planned U.S. pullout of forces, and the 1991 volcanic blast of Mount Pinatubo, hastened the exit and made more permanent the closure of Subic Bay Naval Base and other installations that housed American troops. Over the years, occasional natural-disaster contingency missions driven by Mother Nature sent U.S. forces to help, a routine bilateral joint training exercises like the annual “Balikatan” have allowed some U.S. troops to visit the country. Recent years have seen more Navy ships have pulled into its ports as sailors have helped in community relations projects. 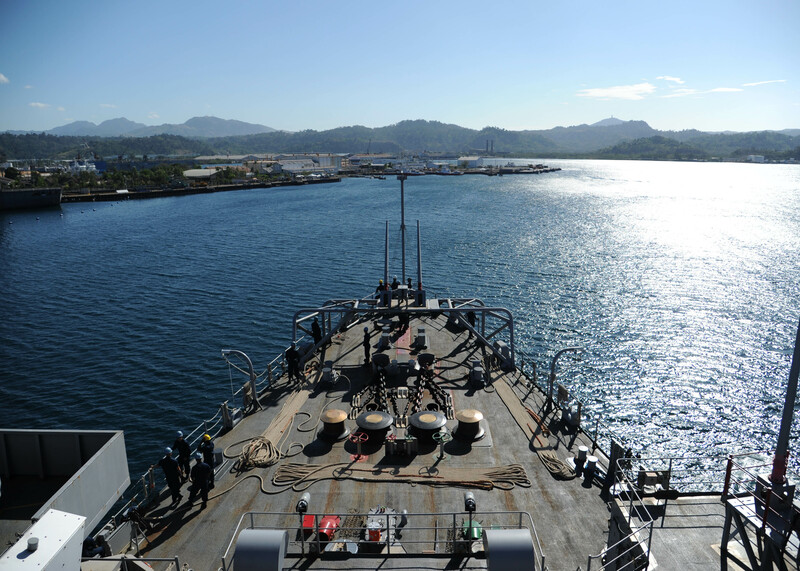 On April 10, sailors arrived in Manila aboard dock transport ship Denver, which is on spring patrol from its Sasebo, Japan, homeport with the Essex Amphibious Ready Group, as the U.S. Pacific Command prepared to kick off this year’s “Balikatan” exercises, which run through April 27.